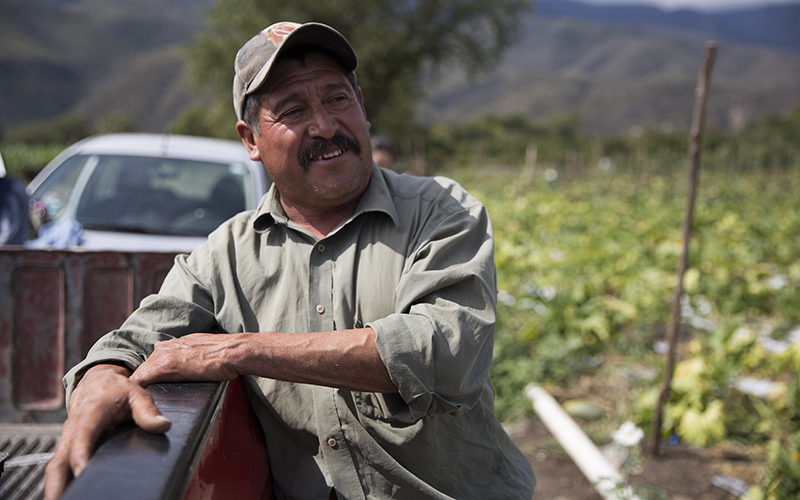 QUERÉTARO — Aurelio Martínez Moran stands on the land he’s worked for nearly 22 years. He leans against his red pickup truck and looks out at the fields where workers tend to rows of corn, chili, zucchini and tomatillo. At 18, he was like them, a field worker. Now he rents and farms 30 acres of the land where he once labored. Martinez has found shaky success where most struggle. His business hinges on unsteady markets and unpredictable weather. Even in central Mexico, where corn farming has been an established livelihood for thousands of years, he depends upon the ebb and flow of U.S. trade. Since the implementation of the North American Free Trade Agreement, he and others have struggled to compete with agricultural products flowing in from the United States at aggressively low prices — especially corn. At the same time, he benefits from low-priced, high-quality U.S. seeds, fertilizer, insecticides and farm equipment. “Our grains, they are not bought anymore because cheaper grains arrive, and ours don’t have a good price,” he said in Spanish. He has had to downsize his farm from 150 acres to 30. Now with NAFTA being renegotiated and the U.S.-Mexico trade relationship hanging in the balance, his family worries that the prices of those products he relies on turn up sharply. For Martinez that could be the last straw. But President Donald Trump’s anti-Mexico trade pronouncements have prompted a grassroots and political push here to reclaim a trade that was once at the heart of Mexico, marking a significant shift for farmers like Martinez and his counterparts in the U.S.
A bill, introduced by Sen. Armando Rios Piter of Guerrero, proposes that Mexico stop importing corn from the United States. It calls for Mexico to reinvest in domestic production and import from other trading partners like Brazil and Argentina. His bill was eventually hung up in committee, but experts suggest that the push to “reclaim” corn could be a powerful one. 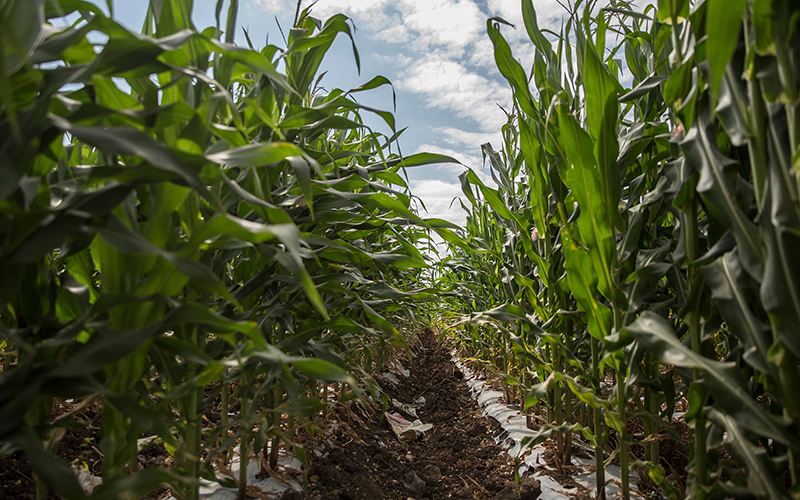 Corn holds a special place in Mexico’s history – it was essentially discovered here. However, in the past 20 years, it’s come to mean something else – a glaring example of how NAFTA has worked against small family farmers in Mexico. After NAFTA was implemented in 1994, U.S. corn prices dropped exponentially and corn from the U.S. flowed into Mexico. Unable to compete with the prices of the imported corn, many small-plot farmers could no longer make a living. The same happened with small farmers of other crops. In the 10 years after NAFTA, the agricultural sector lost 1.4 million jobs, according to a 2004 analysis by the Carnegie Endowment for International Peace. Martinez has had to be flexible in order to stay competitive in the market. 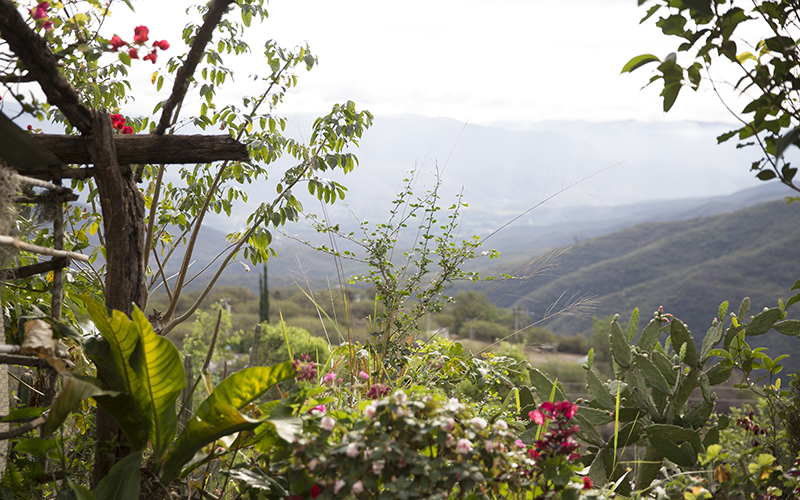 Living in the Sierra Gorda, a high, mountainous and tropical region of Querétaro, he can farm corn and other products in the winter when other producers, like those in the Midwestern U.S., cannot. He and other local farmers pool their crops to sell in larger quantities in larger cities in an attempt to get better prices. But corn remains among the crops he cannot reliably export to the U.S.: Prices are too low and the quality of U.S. corn is too high. If Rios Piter’s bill were passed or if Mexico were to shift away from U.S. corn, it could shake up a trade market that accounts for nearly $2.6 billion in U.S. exports annually. Mexico is the largest corn export market for the U.S. and is especially crucial for Midwestern farmers. “If President Trump is sending a message to Mexico saying, ‘You guys play ball or we’re going to hurt you,’ this piece of legislation in Mexico is saying, ‘We can hurt you, too,’” said Ed Schafer, former U.S. Agriculture secretary under President George W. Bush. For Mexico, the bill would mark a reinvestment in low- to mid-level farmers like Martinez who actively work to produce corn, but struggle to compete, according to Tim Wise, a senior research fellow and former director at Tufts University’s Globalization and Sustainable Development Program. The bill didn’t begin as a move toward reinvestment but rather as retaliation to Trump’s anti-Mexico rhetoric, threats of a border tax and calls for NAFTA renegotiation. The idea to focus on corn, however, was sparked not in Mexico, but in Phoenix. Immigration lawyer and activist Daniel Rodriguez proposed a grassroots boycott against U.S. corn, #NoMaízGringo, to push back on Trump’s executive order on immigration. Rios Piter took the concept of the boycott and turned it into a more Mexico-centric bill. “This started as a grassroots idea by Mexican immigrants in Arizona, in a state where we’ve gone through SB 1070, we’ve gone through very hateful anti-immigrant legislation and we’ve learned how to fight things like this,” Rodriguez said. Rodriguez chose corn because it’s become a massive trade commodity for the U.S. and a symbol of the U.S.-Mexico trade co-dependency that evolved under NAFTA. He said, in a way, Rios Piter’s bill was a sort of an “unexpected, unwanted” side effect of their movement picking up steam. The corn boycott was originally set to be a grassroots movement inspired by past boycotts against SB 1070 and the Cesar Chavez-led grape boycott from 1965-1970. “Once we politicize this idea or once we make it about parties, whether it’s in the U.S. or Mexico, then the people are not going to be as supportive,” Rodriguez said. But the issue has helped raise Rios Piter’s profile. He recently announced a bid to run as a presidential candidate for the independent party in Mexico’s 2018 presidential elections. In addition, the idea of playing the “corn card” has been thrown around as a potential bargaining chip in impending NAFTA trade talks, while the concept of reinvestment in the domestic agriculture industry has generated increasing focus in Mexico. 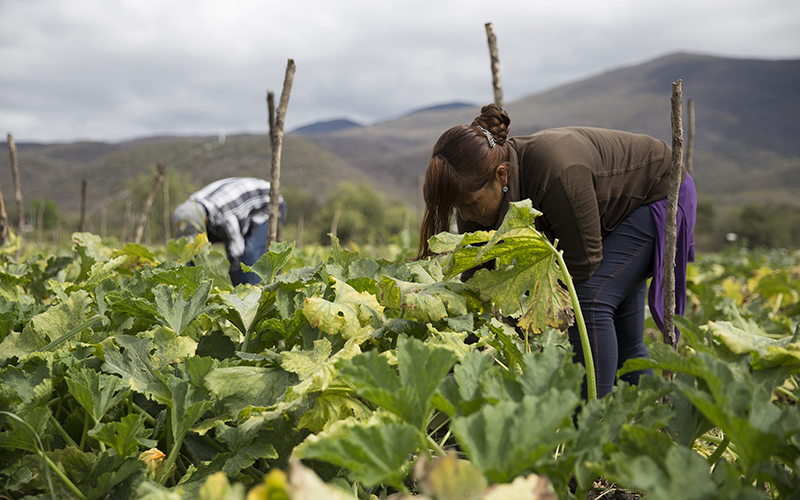 Martinez’s daughter, María Guadalupe Martínez Martínez, 23, isn’t convinced the bill or a boycott would better the lives of family farmers like her father. She grew up in the small agriculture-centric village of Conca, and said she has worked hard to get away from that life. Instead of working from 7 a.m. to 3 p.m. in the fields with her father, she walks through the city of Santiago de Querétaro in heels and a blazer, working at an architecture firm at night after her morning classes at Instituto Tecnológico y de Estudios Superiores de Monterrey. She sat eating lunch in a Subway restaurant two blocks from her job and discussed her father’s work, far removed from the fields she grew up around. Aurelio Martinez and his wife placed heavy importance on the education of their eight children with the goal of giving them a chance to leave agriculture. “Since we were young, my parents would constantly tell us — because they themselves only finished elementary school and had no further schooling after that — ‘You need to study, you need to get an education,’ so we would always get the highest grades in school,” Maria Martinez said. 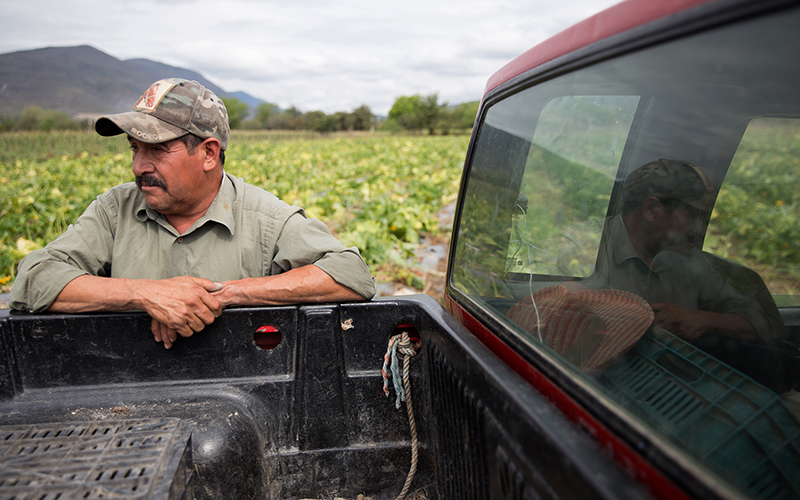 For those in the business of low-level farming, especially in the Sierra Gorda, Aurelio Martinez explained there are often two ways to get out: education or at immigrating illegally to the United States. Martinez did the latter. When he was a farm worker in Mexico at age 32, working long hours in the field with no prospect of growth, he knew he had to make a change. “I got desperate and I thought, ‘I’m not going to do anything here, I will continue to be a pawn like always,’” Martinez said. He immigrated illegally to the U.S. in 1998, where he worked for two years and saved. When he returned home, he invested, starting his own farm business and putting his eight children through school. As he stood among his rows of crops, Martinez said he was proud of the life he’s built with a third-grade education, but wants something else for his children. María, who’s been at the top of her class from a young age, has urged her father to take out a loan and get out of agriculture. She said he recently considered emigrating the U.S. again because of hard times, but ruled it out because he was older and didn’t want to leave the family. She said reinvestment in farming would be good for the country and farmers like her father, but worries success would be unsustainable. The agriculture industry and trade itself has grown significantly between Mexico and the United States since trade barriers dropped due to NAFTA. In 1994, the U.S. imported $2.9 billion from Mexico in the agriculture sector alone. In 2016, the U.S. imported $23 billion, according to the Office of the U.S. Trade Representative. But that growth was among major companies and corporate farms — not small farmers like Martinez. So while imports and exports, especially among crops like corn in the U.S., have seen a massive boost since the start of NAFTA, Mexico’s poverty rate has not changed significantly since 1994. About half of Mexico’s 127 million people continue to live in poverty. Levels of informal employment — jobs without benefits, rights in the workplace or a minimum wage — made up 59.1 percent of the workforce in 2013, according to the International Labor Organization. That number has also stayed fairly consistent since 1994. Corn remains a chief example of Mexico’s damaging dependency upon the U.S., Wise said, something that has made it, in many ways, a loser in NAFTA in the long run. He said Rios Piter’s bill may not be monumental, but embracing the concept of the Mexican government reinvesting in its own agriculture, specifically corn, could be. The possibility of a “trade war” is one that doesn’t suit the interests of either country, said Schafer, the former agriculture secretary. Schafer, a former North Dakota governor and current president of the University of North Dakota, knows the corn trade well. Corn is responsible for large portion of North Dakota’s economy and it was one of the states Rios Piter specifically named when discussing Mexico’s dependency upon U.S. corn. In his time as governor, Schafer worked to bolster the state’s agriculture industry, placing a heavy focus on trade and sustainable agriculture. He said the problem for Mexican farmers isn’t necessarily trade with the U.S., it’s the fact that those farmers don’t have the safety net U.S. farmers do. Henry Miller, an American activist who’s lived and worked in Querétaro for years, is trying to create that kind of support. Miller, who moved to central Mexico in 1995, doesn’t focus on legislation, he doesn’t focus on political maneuvers or NAFTA renegotiations. Miller instead focuses on grassroots efforts, walking around the rural farming communities in the central Mexico states of Querétaro and Guanajuato with a straw hat atop his head, influencing people with fluent Spanish coated in an American accent. 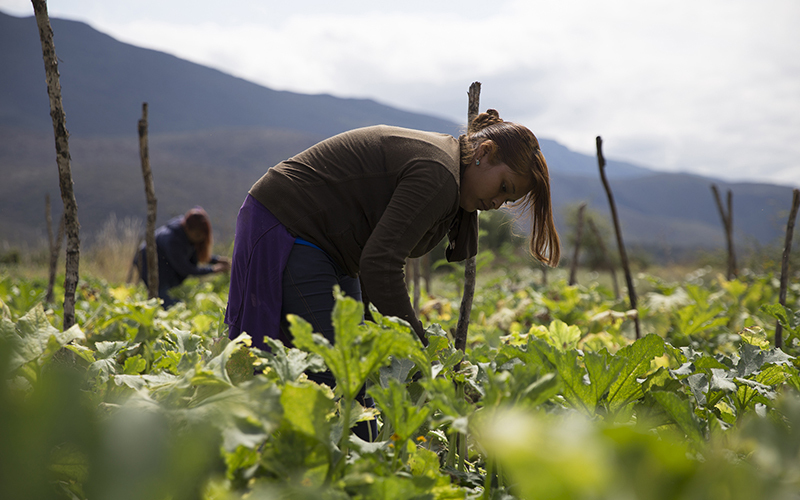 Miller is the leader of a Querétaro-based organization, El Maíz Más Pequeño, which focuses on providing rural farmers in corn-dominated areas with the tools to modernize their trade and try to make their farms sustainable livelihoods. “When the cheap international grain comes across the border, that meant that the national grain, the cost and the investment to produce corn in Mexico, just wasn’t worth it,” he said. He believes reinvestment is essential, but is hoping to see reinvestment on a local level as opposed to a national one. He said the goal isn’t to compete with U.S. producers but should be to rebuild local economies. “What we’re trying to do in the schools is promote small-scale agriculture in the homes,” he said. Miller works in schools with students who come from agricultural backgrounds. He tries to bridge generational gaps like the one in the Martinez family and to let students know that, if done correctly, farming can be a sustainable trade. He teaches lessons weekly to 104 high school students in the Sabes Cerritos School system in Guanajuato. The students come from 37 different communities, many with corn-based economies. He hopes to not just educate the students but to have them pass on their sustainability lessons to their farming parents. He walks through the school, chatting with students and teachers. He’s worked with them for years. He and students work projects that focus on the economy, the area they live in and sustainability in water and soil. “We’re not seeing an educational system that is retaking agriculture as a topic of study or a topic of focus with necessary resources in order to create a productive generational relief,” he said. Yet Miller has found only mixed success. Most of his students still don’t believe small-plot farming is the future, electing instead to work in manufacturing jobs. He said there needs to be an ideological shift for rural farmers to reclaim their main asset — their land.